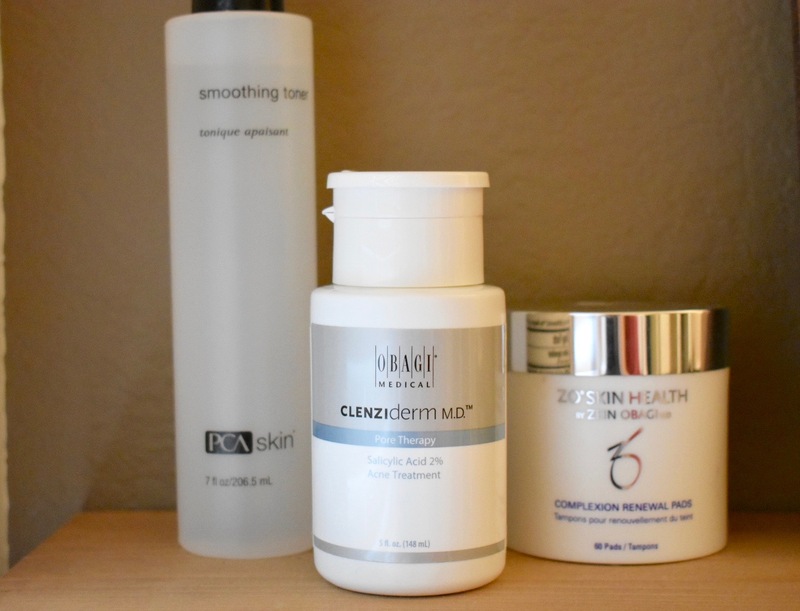 I'm so excited about this post... For the longest time I thought toner was a waste of time and money, but I have found a few that I LOVE and they make SUCH a difference! Toner is one of those things that you can get away with not using if you are trying to be minimal with your routine and/or on a strict budget, but if you want to take your skincare routine to the next level and make sure your face is free of dirt, oil, and leftover makeup then I would try one of these out! I almost always double cleanse (especially when I have makeup on). I oil cleanse first with hemp seed oil to get the bulk of my makeup off and then follow with my ZO exfoliating cleanser. Toner gives me that extra squeaky clean, get all the excess makeup off feeling. Now, I always follow with a good moisturizer so I never feel dried out. 1. PCA Skin Smoothing Toner- This one is great for oily/acne prone skin. I'm still pretty oily because my super oily skin is hereditary... thanks dad. This one has lactic acid as well as aloe... to keep the skin exfoliated yet hydrated and soothed. I have honestly been loving this one lately and I feel like I've seen a major difference since using this product. I mostly use this one every other night if I'm not wanting to use more salicylic acid. I find I can use this with a salicylic spot treatment if I have a blemish and it's not too harsh for my skin. 2. ZO Skin Heath Complexion Renewal Pads or Oil Control Pads-OK STOP. If you have acne prone skin you 100% need these in your life. I am totally obsessed with these and they are my absolute favorite. These are presoaked pads with 2% salicylic acid as well as glycolic acid which is fantastic for acne prone skin. My favorites are the Oil Control pads because those are the ones with 2% salicylic, I just happen to have the complexion renewal open and currently in rotation. The complexion renewal also have salicylic but not as much as the oil control pads.These give you a clean feeling without being TOO drying. If you use these do NOT use them twice a day. I would suggest once a day if you are SUPER oily otherwise every other day. I am so in love with these and I even use them on other parts of my body if I'm having a breakout (my back, shoulders, chest, etc.) These are so good and I cannot recommend them enough. 3. Obagi CLENZIderm MD Pore Therapy- This one is so similar to the formula of the renewal pads. They were both created by doctor Obagi this is just the first formula. I will rotate these two (you don't need both, just giving options) and I apply this with a cotton pad. I will say I don't like that this one has the purple coloring to it, so if you're not about that, then stick to the ZO pads. Honestly, I don't mind it and it doesn't irritate me or bother me in any way. The ingredients are very similar and pretty much work the same. This one also has 2% sal acid. It also has glycerin which is a soothing ingredient and will help to reduce irritation. I find the only differences between the two are that this one is just the liquid, no pads included, and the fact that this has menthol in it. I believe this is for that cooling as well as "pore tightening" effect. This one has a nostalgic scent for me and I don't know why. I feel some deja vu when using this and I LOVE this scent. It tingles a bit when applying (menthol), but I don't mind it. Again, it's not too drying for my skin especially when I follow this with my PCA clearskin moisturizer. Loving this one as well. There is a pretty hefty price difference between the two, the ZO pads will run you about $51 and the Obagi clenziderm about $30. Either of these are a fantastic option for oily skin and I highly recommend both. If you're in the Austin area, let me know if you want the hook up! If you''re in the BR area, my lovely ladies at LWCA offer both the Obagi line as well as ZO Skin Health. I honestly use and love each of these. If you don't have oily skin I still would recommend using a toner. I love the PCA Nutrient Toner for ALL skin types (this one is SO good, let me know if you want more details) as well as the Thayers witch hazel toners.